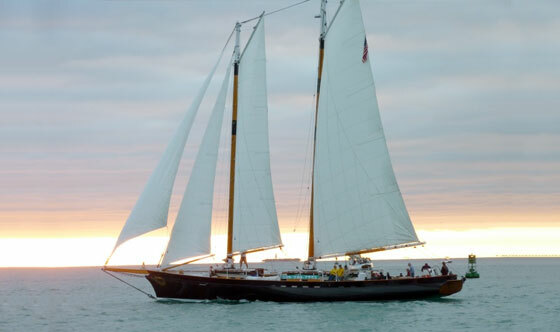 What best way to experience Key West than on a Key West Sunset Sail aboard a classic schooner!? Cruise with us into the horizon. Sip on Champagne as we take you to a place you have never been before. Our expertly trained Captain and Crew will give you a new kind of experience that is sure to last a lifetime. We will take you on a magical sailing ride with the wind in your hair a your soul filled with joy. We also know that experiences become legendary stories for future generations to come. Let us host you on an adventure that will leave you breathless and become the next story told to friends and family. Why would you pick us over the many Sunset Cruises in Key West? Because our yacht is a contemporary design for a classic experience. You will have old world charm with the speed and grace of the new. So get your tickets now for your Key West Sunset Cruise and let us dazzle you as you kick back and relax. Enjoy the best Key West sunset sail on Schooner America 2.0! Take in the vibrant colors of Key West’s famous sunset as you sip champagne, and dine on passed hors d’oeurves. On this Key West Sunset Cruise you will magically glide through the crystal clear surrounding waters. This two-hour Key West sunset cruise features complimentary champagne, wine, beer, soft drinks, and water. Passed hors d’oeurves are provided, including shrimp cocktail, a cheese plate, and delicious veggies! Sit back and relax while she plies effortlessly through the turquoise green Key West sailing waters and off towards the horizon for the quintessential Key West Sunset experience! Come sail with us for the SAIL PHILADELPHIA event! Sail with us aboard the Schooner America 2.0 for this epic event! Spend your Memorial Day Weekend with us at Sail Philadelphia for four days of waterfront festivities, ship tours, and sailing excursions on the Delaware River. Tall ships from U.S. and international ports will dock at Independence Seaport Museum and Penn’s Landing from May 24– 28. Details and information will be available at sailphiladelphia.org in the coming weeks, but you can begin planning your Memorial Day Weekend in Philadelphia, now by booking Ship Tour tickets here: and 90-minute Day Sails and 120-minute Twilight Sails here. Schooner America 2.0 is our stunning, black-hulled, 105 foot sailing yacht and a tribute to the first Schooner America – winner of the first America’s Cup in 1851. Sit on the open decks that feature comfortable seating and bar service for up to 76 and take in the view of these magical ships. The Schooner America 2.0 will glide effortlessly through the waters and get upfront and personal views of the stunning yachts that will visit the Delaware River this coming May. Schooner America 2.0 Aerial View from Classic Harbor Line on Vimeo. Classic Harbor Line – Key West Sailing from Classic Harbor Line on Vimeo. Soak up the unique history as you walk through the old Key West Historic Seaport also known as the Key West Bight. Home of many fabulous restaurants, bars and the famous Schooner America 2.0. Breathe in the refreshing salty air. Listen to the sounds of the lines clanking on the masts of the tall ships docked in the marina. Stop in at the legendary Schooner Wharf bar for a drink. 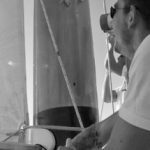 Listen to some live music by the local talented Key West musicians before embarking on your sunset sail aboard Schooner America 2.0. Get your tickets from our friendly sales representative located at our ticket booth just outside of the bar. Step aboard and experience the best Key West sunset sail that the Keys has to offer aboard Schooner America 2.0. Reaching at 105 feet, this Schooner is a tribute to the original “Low black schooner: Yacht America” that won the very first Americas Cup Race in 1851. The open teak deck features comfortable seating and bar service for up to 76. Let our most professional crew cater to your needs as you watch the sun dip beyond the horizon. Kick back and relax as the boat cuts through the emerald green waters and sip on a beverage of your choice to catch a glimpse of the green flash. Key West is known for its famous sunset, so why not do that aboard this tribute to the famous “Low black schooner”! Whether you join us for a day sail, special event or go sailing for sunset you are sure to grab some amazing photos! It will definitely be a memory that will last a lifetime. Click here for your Key West Sunset Tickets. Looking to get out on the water for a romantic cruise in Key West for Valentine’s Day? Grab your loved one or your best friend and join us aboard the Schooner America 2.0 for a memorable evening sail in the emerald green waters of Key West. Step aboard this stunning sailboat for a 2 hour Valentine’s Day Key West Sunset Sail and tickle your taste buds for a Champagne and Aphrodisiacs Pairing. Sip on Champagne as you glide through the water and watch the sun dip behind the horizon. You may even get a chance to see the famous Key West green flash! 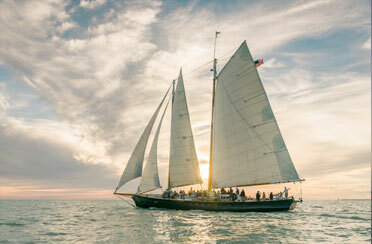 What better gift to give than a Classic Harbor Line Key West gift certificate for a sunset sail aboard the stunning Schooner America 2.0 in Key West FL. You cannot go wrong and will not disappoint with a Key West Holiday Gift Certificate! Sometimes there is a lot of pressure to give the perfect gift. Why? Because you want to make sure that you are giving the most perfect present to the person you love. You want to feel good about what you are giving them and know that they will enjoy every piece of it with all of their heart. That’s enough pressure to make you go crazy. Well stop pulling out your hair and jump aboard! Classic Harbor Line will be sure to take care of your friend or loved one by surrounding them with the warm and friendly service that our crew has to offer! They will be in good hands with the Captain and Crew and will have an experience that will be a lasting memory of a lifetime aboard an elegant schooner! Whether you give a Key West Sunset Sail or a Key West Afternoon Day Sail you are sure to put a smile on your loved ones face! Gift certificates are available for almost all of our unique cruises, and are easy to get! Join us for the Key West Lighted Boat Parade! Step aboard the Schooner America 2.0 for this famous Key West annual celebration. This festive holiday event pulls the local community of seafaring sailors together to compete with their artistic styles! Enjoy the view of their many creative and imaginative holiday decorations! Motor yachts and sailboats. Kayaks and Schooners. All decked out in Holiday Lights parading around the beautiful Key West Bight showing off their twinkle. Have the best seats in the house and watch up to 30 boats compete for first place in this Schooner Wharf Bar tradition. Relax aboard the Schooner America 2.0 for a memorial experience. Parade through the vast darkness of the ocean and see a sea of holiday lights floating magically through the night. Cozy up and sip on Champagne and join us for this wonderful tradition. 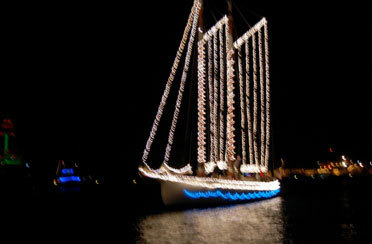 Join us for Key West Lighted Boat Parade, a favorite maritime holiday event. 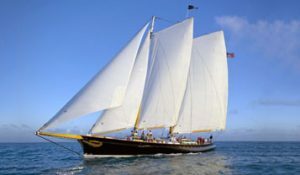 Sit aboard the fastest, most elegant schooner, the brand new eco-friendly, America 2.0 as we parade through the Bight and Harbor of Key West! She’ll be fully decorated in Holiday decor with up to 30 other Key West vessels in the annual Key West Lighted Boat Parade. Cruise aboard America 2.0 while taking in this magical display of holiday spirit. All of these vessels will have the opportunity to show off their creative and imaginative holiday decorations as they glide by the viewers and judges at the Schooner Wharf Bar. 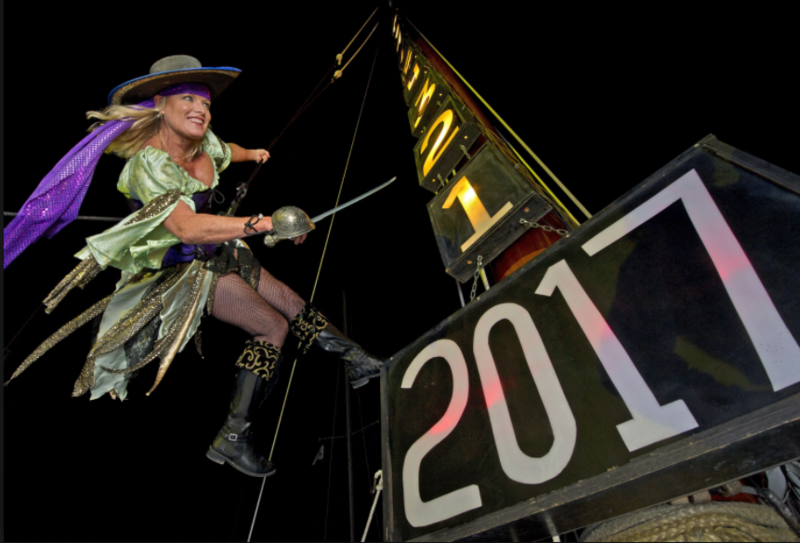 Join us for the best seats in the house on this annual tradition of the “Lowering of the Pirate Wench”! 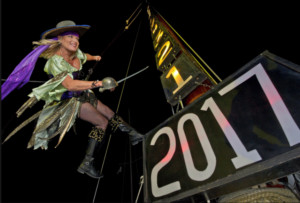 Each year we hoist the famous Schooner Wharf Bar Pirate Wench to the top of our 100 foot mast aboard the Schooner America 2.0. Count down lights are hung from the top of the mast all the way down to the schooner deck. She is hoisted up for all to see and then dramatically drops down the mast with the count down lights to bring in the New Year! Sit aboard with us and have the best seats in the house to celebrate New Year’s Eve in Key West. Crowd free and comfortable sit with us and let our professional crew serve you your drinks and hors d oeuvres. There is a perfect moment of sailing on every voyage. It happens just after the engine is shut off, after the sails snap at the wind on their way up the mast, after the boat falls off the wind’s nose searching for her heading. It’s when she surges forward under her own power, slicing through the waves and sailors feel the wind rushing past their ears, hear the water rushing past her hull. It’s a physical experience that elicits an emotional response of recognition: Ahhhh, now we’re sailing; this is sailing. Aboard the America 2.0 on a recent afternoon, the moment was marked by a collective “Ooooh” from the dozens of guests aboard the large schooner. Because make no mistake, this excursion is unlike what the other party boats in Key West have to offer. It’s not about the free beer (although there’s that, too), or about snorkeling or glib descriptions of Sunset Key. This trip is the chance to experience the primal sensation of sailing aboard a well-made craft in beautiful blue water. It’s about “burying the rail” — a sailing term that describes how the boat tips when the sails are loaded with power. Classic Harbor Line has two boats in Key West. The America 2.0 is a brand new 100-foot-long recreation of the famous 19th century schooner that first won the America’s Cup in 1851. The Adirondack III is a 1890’s-style pilot schooner that is 80 feet long. The America 2.0 boasts 3,500 square feet of sail area. With a light hull, carbon fiber free standing masts and a wing keel, she’s truly a nimble boat. Wide decks and outward-facing ergonomic seating around the cabin make her comfortable. The extremely able crew and captain make sailing look easy (although old salts would probably say that it is, given the exceptional design). The boats are owned by the Scarano Boat Building company headquartered in the port of Albany, N.Y. It’s unusual for excursion boats to be owned by the builder, but the Scarano firm has made a successful foray into this branch of tourism. The Classic Harbor Line commands five ships in New York City, two boats in Key West and another in Newport, Rhode Island. The America 2.0, the flagship of the enterprise, winters in Key West and summers in New York City. She will be leaving sometime in May to head north, while the Adirondack III stays in Key West year round. All the boats have a bit of history. “We specialize in building excursion and attraction boats that are, for the most part, period boats. Of course, the designs have been modified to achieve Coast Guard certification for passenger use,” Scarano said. The Classic Harbor Line meets every safety standard from easily accessible life jackets to a very experienced crew. About the only thing that it can’t guarantee is the wind. “On days with a light wind, it’s a very relaxing tour of the harbor,” said Capt. Neuhauser. “But when the wind’s blowing it’s really exciting to be out there. Both novices and old sailors will have a great time.” Our advice: Pick a windy day and hang on. To all of the Key West brides out there, whether local or planning a destination wedding, have we got a treat for you! We are so excited to introduce you to one of the most unique Florida Keys wedding venuesaround: Classic Harbor Line‘s Schooner America 2.0 in Key West. The gorgeous vessel is a venue ON the water! While we are completely head-over-heels in love with all of the beach wedding venues in Key West, we love the romance of having your wedding on an iconic vessel like the Schooner America 2.0. If it’s been a childhood dream, or simply a recent fantasy, to have your wedding on the ocean with the wind in your hair, then this iconic vessel is perfect for you! They love hosting intimate weddings for up to 70 guests, and even provide champagne for a sunset toast. (Swoon). We asked Sunny, the General Manager, all about Classic Harbor Line, and he filled us in on what is truly unique about this Key West wedding venue. Sunny Andracchio is the General Manager of the iconic Schooner America 2.0, and he loves nothing more than sailing around Key West – and of course hosting amazing Key West weddings on it. If you’re throwing around the idea of having an intimate Key West wedding on the ocean, then you must read further! Sunny absolutely loves what he does, and his passion shines through as he gushes about his gorgeous vessel. How long has Classic Harbor Line been hosting beautiful Key West weddings? What do you love about your unique Key West wedding venue? What is the ideal size of a wedding on Schooner America 2.0? “The Coast Guard rated capacity for the Schooner America is 75. We generally like to keep the capacity at 70, but it would be comfortable for a private charter for just 2 persons, or for a Key West wedding up to that number (70). As you can see, she’s a very larger schooner: 105 feet long and built for speed and comfort. There is plenty of seating space and the heads are exceptionally clean.”What are the most special aspects of planning a Key West wedding on Classic Harbor Line‘s America 2.0? 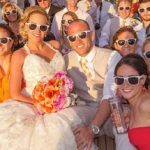 Why do brides choose Classic Harbor Line as their Key West wedding venue? What would you give to the bride who is searching for her dram wedding venue in Key West? Any last thoughts for the excited Key West bride and groom? Here is a comment from a couple who was recently married on Schooner America 2.0 on March 13, 2014, and they really sum up why getting married on the water is magical and memorable. We loved getting to know the team out at Classic Harbor Line, and we hope you loved reading about this unique wedding venue in Key West. This beautiful slice of paradise is full of romantic and intimate wedding venues, but we think that Classic Harbor Line couldn’t be more ideal for the bride & groom looking for something a little different, and an experience they – and their guests! – will forever cherish.